We have been estimating and trying to guess how many cubes we could fit into our shoes. We then counted and decided if our estimate was "too many" or "too few". It was great fun learning this new skill. We are learning to subtract! We worked on our mathematician mat and blasted rockets up to space. We then tried to record our results. We rolled a large dice and counted the correct number of conkers into the hoops. 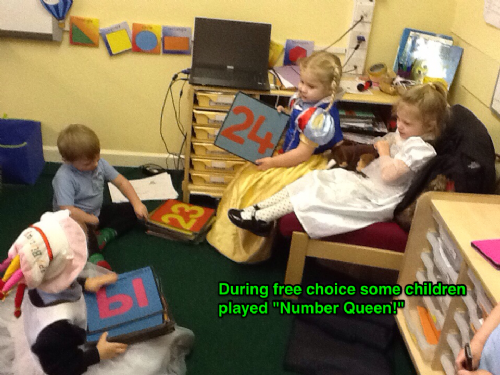 We then found the total by adding the two groups together. We had a challenge to try and find different ways to make 5 using the unifix. We then tried to record our results. We enjoyed ordering numbers with the carpet tiles. Well done everybody!